My idea of bikewear has . . . evolved a bit since my early days of riding. At some point after becoming someone who rides her bike to work occasionally, I became a bike commuter. An every day, rain or shine, clipped-in-shoes, road-bike-riding commuter. No more swapping stuff in and out of panniers—it’s always in the bag (now a cute one) if it’s riding season (which is at least 10 months of the year here, if you dress for the weather). Hassle factor gone. Then he found my Specialized Dolce road bike and brought it home. Once I rode the 18-pound sweetie, I was hooked. 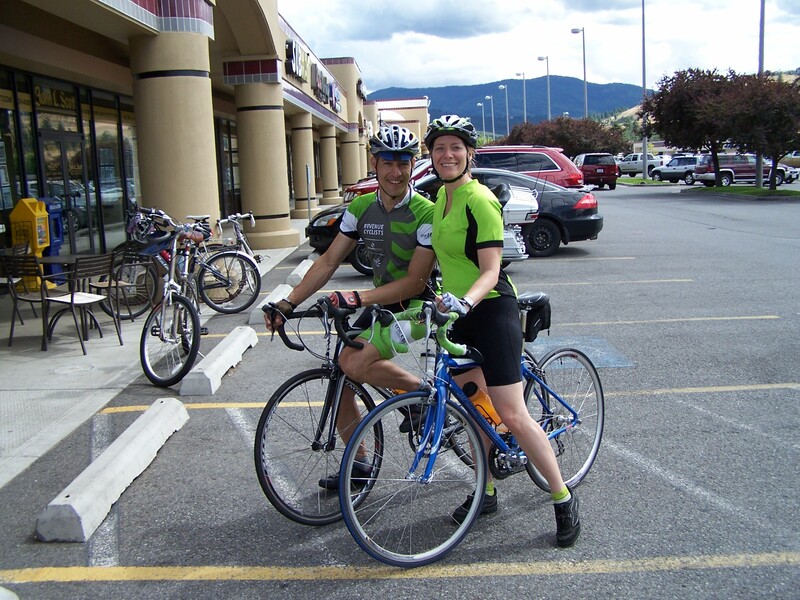 We loaded it up as a commuter with racks, lights, and fenders, which I suppose makes a “real roadie” cringe, but I’m not big on defining people as “real” riders or “not real”. But even in those years with crazy-deep snow, I was able to ride my bike every month of the year, finding days with open, dry roads in December, January, and February. I just don’t drive if I can help it. Along the way I became a bike activist. I founded and chaired Spokane Bikes (formerly Bike to Work Spokane), served on the City of Spokane Bicycle Advisory Board, and on the leadership team of SmartRoutes Spokane (our participation in the Rails to Trails Conservancy 2010 Campaign). 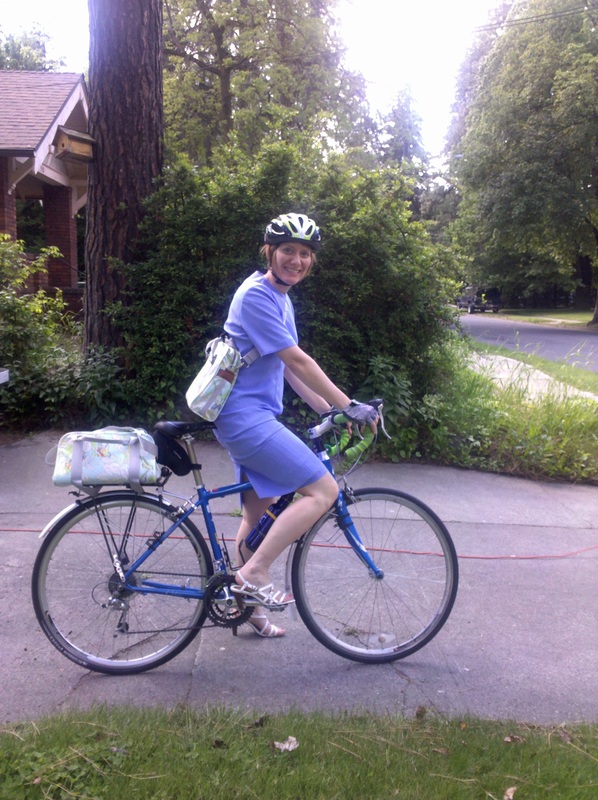 I joined the Bicycle Alliance of Washington and the League of American Bicyclists. I made a final transition to go “back” a step. I stopped wearing bike shoes and locking my feet to my pedals because that too represented a hassle, and I now ride in any kind of shoe. My pedals have an SPD clip on one side, a regular platform on the other, representing my dual identity. I also began adapting my wardrobe to make it easy to ride in everything in my closet. I remind people that I don’t “use alternative transportation” when I bike or bus—I make a transportation choice. Each of us makes a choice every single day when we go out the door. Choice #1: Carry car keys. Park keister behind the steering wheel of a single occupancy something that uses a nonrenewable fuel. Drive (40% of all trips are within two miles of the home). At end of trip, circle the block looking for a parking spot as close as possible to the destination door, to minimize walking. 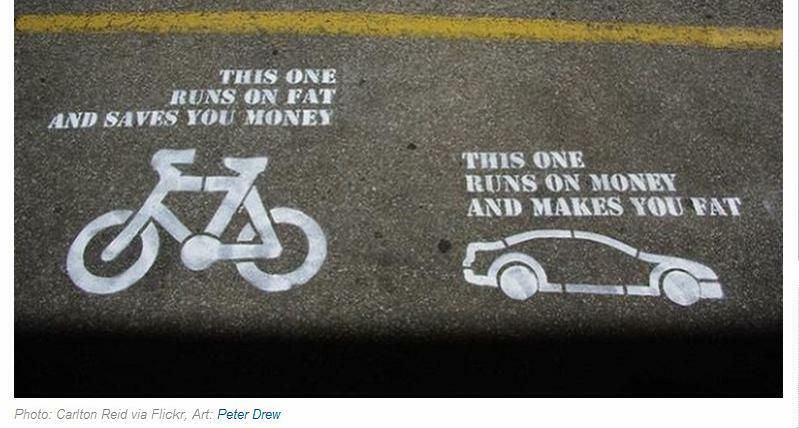 Pay for every element of this choice, from the fuel to the parking-and while you’re at it, pay for a gym membership to get some exercise. Choice #2: Hop on bike. Burn calories per mile instead of miles per gallon. Breathe fresh air. Greet neighbors. Smell flowers, green growing things, running water, roasting coffee, wonderful aromas from local restaurants. See–actually see–the architecture of local buildings. Arrive at work energized. When a midday meeting beckons, ride, lock bike to convenient signpost, walk in, sit down; you’re ready to go while the drivers circle the block. Remember that feeling when you learned to ride a bike as a kid? Riding a bike meant freedom, independence, the ability to get somewhere under your own power instead of relying on others to supply the resources. If you’re still an occasional rider, can you foresee going through more evolution to become an everyday commuter? If you’re an everyday commuter, would you ever go back? True story: I’m a bicycle commuter because in around 2003, the City of Spokane put a bike path on Cedar, right in front of the house I lived in at the time. After complaining a bit about the lost on-street parking, I realized how convenient it looked. (Irony alert) I used my car’s odometer to figure out how far it was to work, and started riding my big-box cheapo special, the “Iron Maiden,” a little bit, then a little bit more. At first my bike commuting took place within strict parameters: very nice weather but not too hot, no meetings outside my office scheduled that day, no after-work events. Before bike commuting on the selected day, I’d drive the 3.5 miles to work (downhill, then flat) with a couple of outfits and leave them there, and just take my shoes with me in the pannier bag. Of course, I’d have a little wardrobe agony of the soul figuring out what to leave at work. After all, I wouldn’t be able to change my mind about what I felt like wearing, nor would those outfits be available to me at home on days I planned to drive. I also underwent the back and forth of moving items such as my wallet with identification, notebook, and other things into and out of the panniers and whatever purse I wanted to carry. I moved from this “once in a while” commuting to biking “pretty often,” including some slightly longer recreational outings on weekends, when I would amaze myself by going 8 miles or more. Mind you, this was all on a Costco special: a heavy-duty quasi-mountain bike thing with shocks. It probably weighed 50 pounds before I put on the rack and panniers. So I actually was pushing a fair amount of metal. And, as I like to point out, it was very definitely uphill on the way home. The first time I tried bike commuting Spokane was experiencing unusually hot weather, 105 degrees or so, in mid-July. Great time to start. At the time I lived at 13th and Cedar. I hit the steep spot on Maple between 6th and 8th—locals will know exactly what spot I mean—and I had to get off and start pushing the bike uphill. Some wit (at least, I think I’m half right) said, “Aren’t you supposed to be riding that thing?” I panted, “I have nothing to prove!” and kept pushing. It became a point of pride to make it just a little farther up that hill each time I rode, until at long last came the day when I actually rode all the way home. Woohoo! Feel the burn, and the sense of accomplishment. What do you remember most about your early days of riding your bike for transportation?